On this site you will find works of Art created by me. I paint in acrylics and pastel on suede mat. I have been painting since 1986. I am also an occasional carver of soapstone. I am married with two children. I tend to paint character studies of subjects in which I strive to create compositions, whether they be human or animal that convey a particular emotion or an identifiable character trait of the subject. Since 2014 I have started to paint subjects with a metaphysical theme or spiritual nature to them that often deal with themes of enlightenment and contain the language of light, in the colour and composition. I first create my compositions in Photoshop, using various photo references to create the image of an idea I have in my minds eye. My style is mainly realistic with a touch of abstraction, particularly in the background, or with a bit of fantasy. My main emphasis while painting is creating a subtle transition between color tones, often adjusting or adding a temperature change in the small area of transition. This aspect of transitional change, I feel, allows my paintings to have a vivid glow and uniqueness to them. I hope you enjoy viewing the artwork as much as I did creating it. Thank you for showing an interest in this site. May 18,19_ Harrison Art Show @ Memorial Hall. Leopard Tree_40x30_acrylic_12/2018. I love painting the big cats and leopards are one of my favourite subjects. 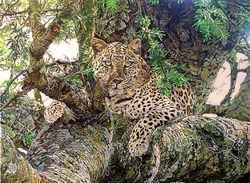 This beautiful Acacia tree had so much character to it that it became the perfect place for the leopard I wished to paint. One With the All One_30x40_acrylic_3/2019. 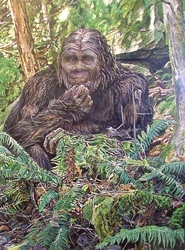 The Forest People have a favorite saying, that they are One with the All One. They are waiting for us hairless humans to return to the All One and to unity consciousness. They call themselves the Xanue, whichmeans the people. They are an interdimenssional people transitioning between their light bodies and their third dimensional bodies. A skill that we also used to have. If you are interested in purchasing artwork, or have any questions, you can contact me at the address below. If interested you will be required to provide me with 1) a photo copy of a government issued photo iD. 2) A recent copy of a utility bill with your name and address and the utility company's name clearly legible. 3) payment is by certified check , ONLY, and must be from a bank within your place of residence. 4) a photo copy of your signature and your name printed clearly underneath. 5) I will take care of shipping costs and I accept checks in the amount agreed to. Unfortunately these measures are necessary as Fine Artists seem to be a favorite target of SCAM Artists. Since I cannot tell the difference between the honest and dishonest via email, there are no acceptions to the above conditions, unless I know you personally. Thank You for your understanding of these nesecary measures.